This edition of the Dramatic Growth of Open Access (DGOA) features a few numbers and facts that might be useful for forthcoming Open Access Week celebrations and presentations. The post starts off with a few really quick illustrations of the growth of open access, followed by detail and some answers to frequently asked questions. DGOA aims at only the most macro level indicators of growth and each post does not link to other major studies in this area. Readers are invited to add key links and details in the comments, only with comments, questions on DGOA itself. Open data is available for download through the Dramatic Growth of Open Access Dataverse (hint: if you'd like to make your own pretty charts I recommend the show growth edition). With Canadian thanksgiving around the corner, I would like to say a hearty thank you to everyone around the world who is doing all the hard work to make this happen!!! There are more than 10,000 fully open access, peer-reviewed scholarly journals in the world, about a third of all peer-reviewed journals. These journals are published in more than 100 countries, and contain over 1.7 million articles. (Details: DOAJ). There are close to 50,000 free-to-read journals of academic interest (including fully open peer reviewed journals, journals with free back issues, and journals of academic interest that are not peer-reviewed). (Details: DOAJ section / Electronic Journals Library). Open access monographs is an area experiencing rapid growth, an annual growth rate of over 40% for both books and publishers. Currently there are over 2,200 open access books from over 70 publishers (Details: DOAB). There are over 2,700 open access repositories (details OpenDOAR) containing approximately 64 million documents of various types (details BASE - note that not all items are open access). PubMedCentral has more than 3.2 million free fulltext documents. There is substantial annual growth in journal PMC participation, including the number of journals actively participating in PMC, the number of journals providing immediate free access, and the number of journals providing open access to all articles. arXiv is approaching one million free documents and an annual growth rate of 11%. RePEC has about 1.5 million downloadable items. The Social Sciences Research Network has close to 500,000 items and an annual growth rate of 13%. 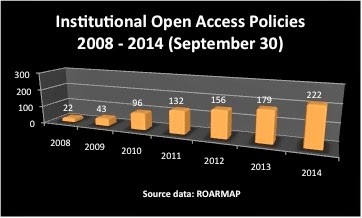 There are close to 500 open access policies, an area growing at a rate of 16% annually (details: ROARMAP). The Internet Archive includes over 430 billion web pages and 6.5 million texts, to name just a couple of items, and in spite of its huge size the growth rates for all types of works continue to be absolutely amazing. DOAJ: over 10,000 journals from 135 countries, over 1.7 million searchable articles.This is roughly one third of the world's scholarly journals. The Directory of Open Access Journals (DOAJ) lists over 10,000 fully open access, peer-reviewed scholarly journals. Over the past year DOAJ has been undergoing some major and much-needed renovations (technical and getting tough about journal inclusion). For this reason, DOAJ journal growth numbers would be misleading at the present time, for two reasons a) comparing apples to oranges, a more inclusive list with a list with more stringent criteria for inclusion; and b) DOAJ is likely behind on adding new journals due to this work. For example, the Sustaining the Knowledge Commons team's open access article processing charges project has found that the DOAJ titles listed as of May 2014 do not closely match the list of titles found on OA publisher sites, with the OA publisher title lists tending to be under-represented in DOAJ. Over the coming year, watch for DOAJ to begin to catch up. DOAJ's stringent inclusion criteria (immediate OA, peer-review, minimum number of articles published) results in an understatement of the works of academic interest that are free-to-read. The Electronic Journals Library's over 46,000 free-to-read journals is the best estimate I'm aware of of the free-to-read category. (Close to 50,000 free-to-read journals would be a reasonable estimate, as the EJL added about over 4,000 journals over the past year). The Directory of Open Access Books currently lists 2,261 books from 77 publishers. The over 40% annual growth rate applies to both books and publishers. Note that as a relatively new service high percentage rates are relatively easy to achieve (lower starting figures). The Directory of Open Access Repositories lists 2,729 repositories, an 11% increase (277 repositories) over the past year. Another way to express this trend, at least in some regions like Canada: having an open access repository is rapidly becoming the norm, an essential service for a university or a research institution. Bielefeld Academic Search Engine (BASE): over 64 million documents from over 3,000 content providers. Over the past year BASE grew by over 14 million documents for a growth rate of 29%. Bielefeld Academic Search Engine is the service that I use for the best guesstimate of how much content is available through all of those open access repositories. This number is far from perfect as not all items in all of the repositories are open access, there could be duplication, and there is a wide range of content types. However, BASE is the best number I have found to indicate the broader growth of open access including all of these content types and even the freely available metadata; and, if only a very small portion of BASE's growth were due to peer-reviewed journal articles becoming open access, that would still be highly significant. For example, if all of the world's approximately 1.5 million peer reviewed articles produced yearly became OA through a repository over the past year, that would only account for 10% of BASE's 14 million document growth. Highwire Free includes over 2.3 million free articles, and 109 completely free sites. PubMedCentral: over 3.2 million free fulltext, 14% increase over past year. 1,890 (close to 2,000) journals actively participating in PMC, a 15% jump from last year. 20% increase in journals offering immediate free access (1,358 journals) and 17% increase in journals with all articles open access (1,163). PubMedCentral: PubMed now links to over 3.2 million free fulltext items, an increase of about 400,000 over the past year for an annual growth rate of 14%. There was a 15% growth of journals actively participating in PubMedCentral, up 243 over the past year for a current total of 1,890 (close to 2,000 would be a reasonable ballpark figure to quote). The number of journals in PMC offering immediate free access increased by 20% to a total of 1,358 and the number of journals in PMC with all articles open access increased by 17% for a total of 1,163.
arXiv is approaching 1 million items (974,813), annual growth rate 11%. RePEC has about 1.5 million downloadable items. Growth rates not available due to a combination of changes at RePEC and my rather substantial error in calculating RePEC numbers in June. The Social Sciences Research Network (SSRN) has 469,960 full text papers (close to 500,00) and an annual growth rate of 13%. The Registry of Open Access Material Archiving Policies (ROARMAP) lists 483 open access policies (close to 500), an increase of 16% in the past year. The Internet Archive continues to be the exception to the rule that new, smaller initiatives have an easier time demonstrating high growth rates. The Internet Archive currently includes over 430 billion web pages (20% annual increase), 1.7 million videos (25% annual increase), 133,000 concerts (10% annual increase), 2 million audio recordings (23% increase) and 6.5 million texts (29% annual increase). For full details and downloadable data, please see the Dramatic Growth of Open Access dataverse. 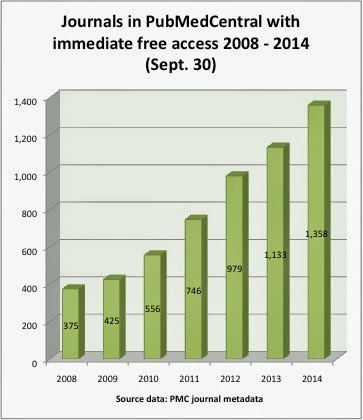 Previous posts in the Dramatic Growth of Open Access series can be found here. Comments on this post, data corrections, and links to other studies on the growth of open access (or if you're making use of the open data, links to your results) are welcome and appreciated in the comments section. Please note that this is a scholarly blog; comments should be signed and relevant interests, if any, noted.